Peaceful student protest violently interrupted by armed police in order to arbitrarily detain the student leaders. The brutal repression of West Papuan student protests last week is indicative of Indonesia’s approach to the region. Wednesday 2 April  marked a global day of action to call for the immediate and unconditional release of the 77 Papuan and Malukan political prisoners currently being held in Indonesian prisons. Protests were staged simultaneously in Melbourne, London, The Hague, Auckland, Wellington, Edinburgh and Jayapura. The protest in the West Papuan capital Jayapura, at Cenderawasih University, was interrupted by armed police with four Dalmas trucks (a kind of troop carrier), two mobile brigade trucks and one police van. As reported in New Matilda, the police forcefully detained Alfares Kapissa, 27, and Yali Wenda, 19, and viciously beat them for 36 hours in police custody. Kapissa, who was the field coordinator of the event, said via Facebook on April 7  that he was in agony from his injuries. He said that organisers addressed the crowd calmly without any knowledge of the police plan to arbitrarily detain the student leaders. “I was kicked, forcefully dragged on the road and thrown into a Dalmas vehicle while been strangled, without any negotiations,” Kapissa said. Kapissa added to comments by Wenda in NM. He said the police kicked and electrocuted him and Wenda, and beat them with the barrel of a gun in the truck for up to half an hour. Jayapura police chief Alfred Papare, told the students and local media in Papua that it is the standard procedure to detain the student leaders for questioning for 24 hours and then release them if charges were not laid. Yoan Wanbitman, chairperson of Papuan Student Solidarity Care for Political Prisoners, said he tried to peacefully negotiate with the police but they refused to listen — and they beat him as well. This created more tension among the crowd of around 150–200 angry students, some of whom threw stones at the police. The police fired warning shots and tear gas to disperse the crowd. Pilipus Robaha, 25, spokesperson of GEMPAR Papua, a Papuan student youth and civil movement, who also organised a group of approximately 100 students at Cenderawasih University’s Abepura campus. Robaha’s protest proceeded without incident, despite an armed police presence. In a phone conversation on Friday 4 April , Robaha said that such brutal action by Indonesian police only motivates Papua’s peaceful movement and taints Indonesia’s democracy. “We [students] are not threatened or shaken by such atrocious actions by out-of-control security forces but it only strengthens and motivates us to consolidate and organise a bigger action to tell the world that Indonesia’s democracy is valid only in Java, not Papua,” Robaha said. The brutal response to the protests is indicative of the current political situation in Papua and Maluku. After more than 50 years of Indonesian rule Indigenous Papuans have seen little improvement in their material circumstances or political rights – despite Indonesia claiming to be a model democracy. Indigenous Papuans and Malukans continue to suffer at the hands of Indonesian security forces. Since Indonesia militarily occupied the region in 1 May 1963, dissenters have been punished with arrests, violence, abuse, torture, unfair trials and intimidation. 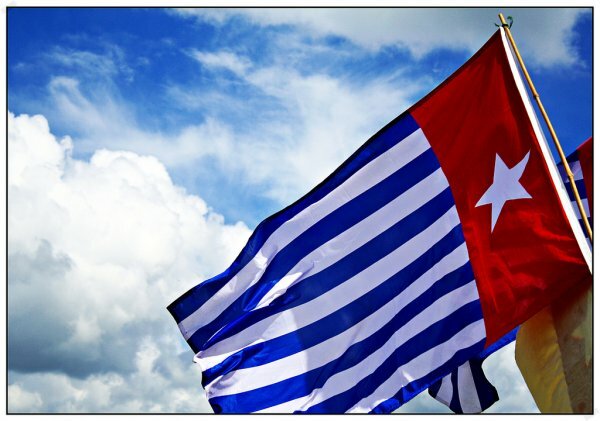 Peaceful protests, including raising the Papuan Morning Star flag, are met with harsh reprisals. The Indonesian security forces’ brutality shows that the world’s third largest democratic country favours a culture of impunity and repressive behaviour over freedom of political expression and self-determination for the indigenous people of West Papua. Ronny Kareni is a West Papuan activist writing for New Matilda.